No, I’m not quite proposing that! But Will and Kate haven’t left me much time to escape from the UK before the royal wedding! So, either I just try to bring forward my plans (a bit of pressure can be a good thing, after all). Or perhaps I just try to arrange a short project or speaking engagement at the time the wedding’s on. One option is HRevolution on 29-30 April (tickets here). Now I only normally attend conferences when I’m being paid to speak; or I can arrange some paid work around the conference, or it’s just really easy to do (like Social Recruiting in London next week). Unconferences like Connecting HR and HRevolution are an exception, but as an independent consultant working in a difficult economy, I still need to be careful about expenses. So – anyone have work in the US for me around then? Or would like to sponsor me my flights (I’m sure we could work out a good deal)? Developments in HR transformation and outsourcing (under the ‘general HR knowledge share’ theme) – hosted by Andy Spence, live from HRO Europe. Tomorrow’s chat (at 1.00pm GMT) takes up back to the Social Business theme, noting that if organisations are to capitalise on Social Media they must first be social entities by habit. So how do they do this? For more answers, see on this blog (eg my posts on Enterprise 2.0), or over at Social Advantage (or contact me!). If you want to know more about the Connecting HR community, see over at the website, or request an invite to join our Yammer group. Or just look out for our Yammer chat every Wednesday (times and possibly days of the week may vary – check on twitter first). I’ve had a couple of interesting conversations about developments in HR technologies recently. For example, at one of the panels at Enterprise 2.0, I was asked about to what extent HR systems limit HR’s ability to rise above compliance activities. I suggested that this was largely an echo of the past – that technology shouldn’t be a a barrier to performance as it was maybe just ten years ago. And then last week in Amsterdam, one of the other speakers suggested new technologies are forming one of the key new inputs in the outsourcing sector. And in the Connecting HR twitter chat later that day, when the conversation moved on to the inability of HR technology to inform broader transformation, I referred to some examples where I thought it was having this sort of impact. Lastly, I’m working with a client which is thinking about making some major investments in technology during the new year. And I’ve been helping them think through some options for this. All of these conversations have included a reference to Workday. So I was pleased on Friday to have a call with some of their staff (following my recent attendance at Workday Rising) to discuss the recently released version 12. And I was even more pleased to see that the updates to the system support the points I’ve been making. 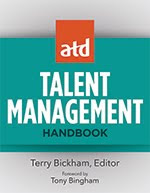 Firstly, there are some great features under talent management – see for example what Steve Boese (who was also on the call) has posted about their faceted search. And I also like the various ways that the system allow businesses to analyse work, and to link talent to work. There’s so much here that for most businesses, there’s going to be more opportunity here than they currently allow their people. The issue is no longer just about technology catching up with business needs. It’s also increasingly going to be about businesses given the freedom to their people to take advantage of the technology. There are going to be some exciting times ahead. I’m an HR Consultant, get me out of here! I’ve been feeling a bit down in the dumps after returning from my second trip to California in one month and with no other trips to sunnier climes coming up till next year. The rain and fog in Amsterdam over the last couple of days hasn’t really helped – just another case of seasonal affective disorder I guess. I’m also not a supporter of the Age or Austerity. What we Brits need right now is a bit of optimism to stimulate more investment. And I don’t think the prospect of a royal wedding next year is going to make up for the general slash and burn of the economy. In fact, it’s probably the wedding that’s got me feeling most fed up. To an extent, my irritation with this about having to fork out for the costs of the Windsor’s security. But it’s also the expectation of ever greater toadiness from the BBC right through to the wedding, and the prospect of more general Dianamania too. I also can’t see how the selling of more crappy plates and other chintz (the production of which obviously isn’t going to be done in the UK) is going to stimulate the economy. So I really don’t understand the delight that some of the queen’s subjects clearly feel. And I’m not a naturally grumpy or cynical person. But I don’t like the monarchy. And I definitely don’t like being a subject of it. (“long to reign over us”? Humbug!). It’s probably time to make a move. I think I’ve probably posted this before as well. But if I’m still living in the UK next July (or whenever the wedding is) I’m going to be even grouchier than I am now. I also managed to speak about HR’s role in Enterprise 2.0 on last week’s HR Happy Hour with Steve Boese, Shaua Moerke and Matt Wilkinson from Socialcast. Do take a listen – and it’s well worth paying particular attention to the part where Matt describes the Socialcast product – I do think this systems’ security and integration features does generally make it a more compelling proposition for intra-organisational use than Yammer (which we’re using inter-organisationally for Connecting HR). I will just say that I thought Matt and I were talking about two slightly different things – ie his interactions vs my relationships, his talking to staff about how they connect today, my focus on supporting strategic objectives etc. I’m going to come back to this on Social Advantage too. The other panel at the Enterprise 2.0 conference, also chaired by Oliver Marks (pictured with me) focused on measures. We noted that because of the complexity surrounding HR and collaboration, many of the things we wish to measure are intangible. I suggested that participating in conversation may often be a better way to measure Enterprise 2.0 initiatives than trying to calculate ROI and noted Jay Cross’ comments on Jack Phillips ROI methodology as an example of this difficulty. However, the ROI of incorporating social tools within HR may be intangible but it’s also, in Joshn Bersin’s words, ‘really big’. We talked about some social learning and social recruiting examples of this. One of my E2.0 sessions was a panel looking a how HR can move out of its compliance role through the use of collaborative / 2.0 technologies. I thought this was a good panel session, and was pleased that we seemed to come to the conclusion that HR is complex, not simple, and that getting beyond compliance means accepting, tolerating, and navigating through this complexity. This is why I do rather disagree with my co-panellist, Danny Portillo (from Rypple)’s suggestion that we drill down, using analysis, to identify simple HR actions we can take. To me, strategic people management, particularly of the collaborative kind, requires synthesis (understanding of the system – the people, and particularly the relationships between people) rather than it does analysis. After this Summer’s E2.0 conference in Boston, where I suggested that people were trying to develop something that was basically designed to develop collaboration in a fairly non-collaborative sort of way – eg without much input from the HR profession – I proposed to speak on HR at the follow-up conference in Santa Clara. I didn’t expect much of a positive response, and certainly didn’t expect to see HR turning into a track of its own at the West coast conference, so full credit to TechWeb for listening and having the imagination to try something new. I ended up being on two panels and will post on these shortly, and I also presented on Culture (I’ll put my notes on this up at Social Advantage). cflanagan: RT @gialyons: #e2conf Houghton-Mifflin is implementing reverse mentoring for their execs this year <-- GREAT #e20 tactic 4 trad'l cultures! All the conference tweets are available here. Also see David Sparks’ write-up on the keynote. And Rawn Shah’s summary of this and the track sesions in Forbes. Or this list of all the blog posts from the conference. Videos of all the keynotes are available at http://tv.e2conf.com. The track whitepaper is at http://www.e2conf.com/whitepaper/HR. I’m not at the CIPD annual conference today as I’m presenting tonight at the HR 2.0 track at the Enterprise 2.0 conference in San Francisco. But I sent the CIPD some inputs on the conference this Summer and thought it might be worth reviewing how things have progressed in the conference this year. 1. You could do with social media being on the conference agenda. This is one of the biggest trends impacting organisations now and HR / the CIPD are still well behind the curve. Ideally you'd have one or more sessions on quite early, followed by the tweet-up etc to drive interest in this. - Another opportunity would be a session with a bloggers panel, like SHRM did in 2009 when they woke up to social media. How have they done? Well, they’ve got Charlie Johnston from Cisco presenting what should be a great session, and CIPD staff are talking about 2.0 in the exhibition but that’s it. And yes they are following up with an event on ‘web 2.0 recruitment’ shortly afterwards, but this agenda needs to be included in the main event as well. 3. You might want to proactively invite some more bloggers to attend as press rather than waiting for them to apply (and feeling that you probably won't be interested). I did get a press invite to the conference this year – the first time I’ve not had to push for one – so a big tick for this one. 4. The tweet-ups have been fine, they'll continue to grow. … as you can see from the booking list… (I think there were only about ten of us last year). 5. You could have some twitter stream displays up - like you did at HRD a few years ago (I don't think this was very successful then but there are more people tweeting now). And perhaps even some displays up as a backchannel during sessions, particularly those on social media. 6. If you see the conferences as a way to engage with your membership rather than a revenue generator (which is what most of your members think you this of it as! ), you want to live broadcast some of the sessions too eg the keynotes, particularly those presented by Jackie et al, and any focusing on social media again. Don't charge for access! 7. You need to do something to get the conference attendee community sites working better. 8. Use interactive devices to involve the audience - eg Spotme / Crystal Interactive. What are those devices people can wear which ping when you get close to someone with similar interests to you. Some of those. 9. You need more CIPD people to sponsor use of social media too. You've got a lot of people blogging and tweeting but they're not doing it at the conference. They should be. And listening to what other people are blogging and tweeting. And responding to their tweets. The CIPD has got its fair share of bloggers, although I think including all their blogs at cipd.co.uk limits their creativity. And there are some ‘meet the CIPD blogger’ sessions in the exhibition (a bit of a strange combination of meet the CIPD, and a meet the bloggers panel). But I doubt they’ll be doing much blogging or tweeting at the conference. 10. Building on this point, can't you get CIPD people to actually look at and talk to delegates as they're walking around instead of looking like they're far too busy to do anything as menial as actually talk to their members! And not hiding away in the speakers lounge. 11. And this is nothing about social media but all about being social also basic conference design. Don't allow your speakers, particularly CIPD people (eg your Next Generation HR session) to run out of time for questions! Nothing turns an audience off like it. We’ll see whether there’s an improvement here compared to last year…. If you’re not at the conference either and in the absence of video streaming still want to follow proceedings from afar, the best people to follow will probably be Mike Morrison @rapidbi and Charlie Elise @charlie-elise. The hashtag is #CIPD10. For more about socialising conferences, see this recent post from Andy Headworth at Sirona Says. I particularly enjoyed this post from ‘TheHRD’ earlier this week. But I’ve already commented to say that I don’t totally agree with him. Given my connection to this topic (having just been blogging on it quite extensively, and being one of the people on one of the lists as well) I wanted to expand on my reasoning for suggesting it’s important. HR is now obsessed (I’d suggest too obsessed) with measurement. And we know we should be measuring more of what’s important. So are we saying influence isn’t important? That would be dumb. It is and it always will be – it’s just the way influence is exerted that’s changing. So if it’s important, we should try to measure it. As I said in my comment to the HRD, I don’t think our current ways of measuring it work that well. Actually, I was with Sian Harrington from HR Magazine on the day the HRD’s post came out and explained to her that I wasn’t criticising their research methodology. (I was criticising the nous of HRDs who had unthinkingly selected people who had, for example, left the UK years before (and have no noticeable impact on the global stage). But I don’t think we should criticise our desire to measure it – within our organsiations – and across our profession as well. Influence is changing. It’s becoming more social, and more online as well. John Sumser is leading the way in new ways of measuring both of these kinds of influence. His lists are also, and deservedly, criticised – but again, I don’t think we should criticise the attempt. Yes, there are better ways of measuring influence - I’m a fan of social network analysis for example (and can conduct one in your organisation for you). 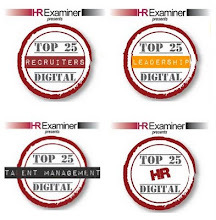 But no one has figured out to conduct an SNA across a whole profession, so at the moment, John’s HRExaminer lists are about the best thing that we have (see more on influence in HR Examiner here and here. 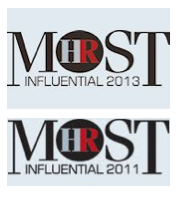 The last reason I think we should support HR influencer lists is their connection to talent management. Linked to my point on social influence, talent is increasingly less about individual ability to have an impact, and much more about having impact through networks and relationships. Yet in his work on SNAs, Rob Cross suggests just 10-20% of those the most connected, key influencers in most organisations are members of these organisations’ talent pools. We need to better understand influence, so that we can be sure we’re identifying and measuring talent in the right way. I’m in the US for the Enterprise 2.0 conference next week but unfortunately arrived just too late for this week’s HR Happy Hour – Episode 74 – ‘Creativity, Flexibility, and Speed’ (they didn’t get much time for calls anyway). Steve Boese and Shauna Moerke were interviewing IBM’s Dan Roddy – the study director for IBM’s Chief Human Resource Officer study based on conversations with more than 700 Chief Human Resource Officers (CHROs) worldwide. The study identifies three areas that are the most important for CHROs and are also most poorly done. Dan explained that leaders need more creativity rather than linear thinking. They have to think differently in order to do something different now that we’re facing higher levels of complexity in business. See this post on imagination (vs evidence) based HR. And this one from J Keith Dunbar arguing that CHROs aren’t as bad at leadership development as they think. One interesting finding here is that organisations using social media for learning and collaboration are more effective in developing skills to support strategic needs. I agree with this, although I suspect the more important use of social media is to enable the workforce to align more closely with changing business requirements, rather than just supporting a traditional, command and control focused planning process. I fully connected, social organisation won’t need workforce planning, as the whole organisation will be much better and sensing and capturing opportunities as they arise. (However, this is clearly some way off for most organisations, so I accept the need for more rather than less workforce planning in the medium term. See this post on workforce planning – and on the need for more creativity too). Workforces are becoming more networked and less hierarchical. This isn’t about replacing hierarchy – you still need control, standardisation, harmonisation etc – but you need to combine this with the ability for people in the field to make decisions. This means you need to think about replacing the hierarchical information flows that networks have taken the place of. culturally not rewarding behaviours that limit sharing etc. Unfortunately, this is the are that CHROs report being least effective – with 78% reporting that they didn’t do anything to support collaboration or weren’t effective in doing it. But is this really the case – or just a another problem from the research (as in J Keith Dunbar’s post)? I think the problem may be over-stated. I suspect that like communication, collaboration is something people will always say they could do more of (even if we know organisations can do too much of it). But I suspect the figure’s probably reasonably accurate all the same. We may be very poor at leadership development, but at least most of us try to do something about it. Collaboration is something that most people and organisations (largely just with the exception of those involved in Enterprise 2.0) don’t even try to influence (there’s even a point of view that you shouldn’t try). 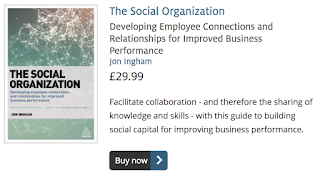 Anyway, the point that I really wanted to make is that the key for IBM is integrating social collaboration into the workflow – connecting it directly into business operations and project management activity. That’s not the key for me – not in most knowledge management roles and organisations any how. To me, processes need to support (not get in the way of) collaboration, not the other way around. But collaboration needs to be a strategic focus which permeates everything an organisation does, and the way people behave – naturally, all of the time – not just when they’re following a process. Like most of IBM’s studies, this is a good report. But I can’t help feeling they’re missed the central point. Just as IBM’s focus on technology initially led them to miss the importance of creativity, so it’s now constraining their thinking to a focus on information, rather than relationships. Collective intelligence isn’t about information flows and processes. It’s about people and their connections. Speed and flexibility isn’t about formal planning processes - supported by social tools, it’s about giving people autonomy to make quicker and smarter decisions – supported by social relationships. Steve pointed out that most of Dan’s suggestions were pretty simple (so why aren’t people doing them?). It’s a point that’s often made about HR too and my response to it is the same for CHRO support for collaboration as it is for HR – it’s not all simple, and even the simple stuff takes skill and insight to do well. I hope I’ll get a chance to come back and review a rethought through IBM survey in another couple of years time! And if you’re a CHRO who can’t do collaboration, get in touch and I’ll show you how you can! 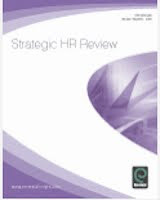 I’ve got an article on HR 2.0 in the current edition (volume 9 number 6) of Strategic HR Review. There are good examples of organisations following this sort of approach in the journal – although it’s a shame that some of them are rather similar to each other eg a US based retailer (presumably Safeway Stores) and a UK / EMEA based retailer, River Island, both introducing social recruiting approaches. The most interesting article to me are ones on Alfa Laval’s virtual strategy process which describes virtual working and leading as something you need to learn as a new discipline but also notes Ashridge research showing that entirely virtual processes can be extremely effective for team building: “Several participants interviewed afterwards said they that although they originally felt that the face-to-face was needed, they now thought that the process would only work if completely virtual”. This echoes my own experience – I think we can do a lot more over technology than we often believe we can. 44% say the technology they use in their personal lives is better than that available to them in the office. For more on HR 2.0 strategy, see this previous post. Or look out for new posts from the HR track at the Enterprise 2.0 conference next week. Measurement is an increasingly topical and important field for all HR practitioners to understand. However, the need is not simply to know the measures and metrics which are most commonly used to support different areas, but to understand which metrics can be used to support different business contexts, HR strategies and other requirements. In addition, practitioners need to understand how analytical tools can be used to further support the chosen measures. This short course considers how HR metrics can be selected to align with strategic needs and drive business performance. The course will include inputson best and emerging practices as well as practice in using the approaches and techniques that are presented. The course leader will discuss various case studies within each section of the course and will encourage participants to share their own experiences and insights into the use of appropriate metrics. I mainly only deliver open workshops in Asia and the Middle East, but there are also a couple of UK sessions where you can catch me over the next couple of months. In an environment where change is the only constant, it is crucial that businesses are designed to respond and accommodate change. And as businesses are under increasing pressure to gain – and maintain – a competitive edge, reorganisations are now more commonplace than ever before. Yet businesses are often not fully equipped to plan, prepare and manage restructurings and reorganisations, potential redundancies, mergers and business transfers. As well as the legal aspects involved in restructures, it is just as important for HR to understand and be able to implement the critical non-legal aspects of restructurings. Reorganisations are one of the biggest changes a business, and its workforce, can undergo. Dealing with staff morale, motivation, productivity and communication of change initiatives is just as important as legal compliance –effective management of change has shown to affect both the short-term and long-term performance of the business post-restructure. HR professionals must develop the skills and knowledge to successfully manage reorganisations and deal with the associated legal and people challenges. I’ll also be delivering another session on HR and social media for JSB on 27th January 2011. Human Resources professionals are at the center of managing the most valuable asset a company possesses - its people - and how to get them to interact and collaborate more effectively. Enterprise 2.0 planning typically straddles the intersection between Line of Business needs, Human Resources and Information Technology. While Line of Business and IT typically have specific and often urgent needs, the realities and complexities of human resources can have longer term implications. And in today's economy, scale is key whether in terms of growth, downsizing, or merger and acquisition strategies. Keeping the nucleus of a business collaborating while blending other cultures into the mix is a challenge often underestimated by strategists who assume the 'boxes are checked' in software solutions. The HR Collaboration Strategies track will discuss how to ensure the HR voice and perspective is heard in strategic planning, and that the Enterprise 2.0 technology being contemplated is appropriate for your company size and personnel profiles. We will focus on realizing business value from collaboration tools, and how to strategize around building on existing technology foundations—including payroll, comps, benefits, incentives and training/learning—to transition into a more connected and aware culture and organization. The realities of staff types, ages and workflow needs will be addressed, including how to shape them so they evolve over time to meet your business goals. Human Capital Management is rapidly evolving and broadening its focus. Today’s mission revolves not only around helping shape culture, and managing compensation and benefits, but on acquiring, developing and retaining key talent, aligning employee performance with business results, and supporting organizational innovation and change. In support of this evolving mandate, companies are leveraging a variety of social and collaboration technologies combined with Cloud architectures that are delivering bottom line results. This panel of senior business and IT executives will examine how they are applying and realizing value from the use of modern technologies to solve specific HCM and related problems. The strategic design and tactical roll out of HR related collaborative Enterprise 2.0 initiatives requires analytic measurement to justify budget and measure success. This session explores case history examples, insights, and the new analytical measurement tools from which performance and quality of data metrics are extracted. Many HR staff are frustrated at never being able to get past core responsibilities: hiring and firing, compliance against governance policy and merger and acquisitions fire drills. This session will explore how to imbue modern Enterprise 2.0 thinking into these core competencies, while leveraging the power of collaborative thinking to accelerate business performance strategically. Policy strategy: Do you embed 'social' policies into existing policies or create standalone governance? This 'real world' session will explore the realities of legacy technologies and explore the blending of new and old ideas around HR. The most valuable assets a company possesses are its people, but politics and divisions between them significantly weaken many companies over time, particularly at scale. Combining E 2.0 tools with other HR based approaches to create social outcomes, helps define and develop a social approach to collaboration and innovation. This session will explore how to take advantage of the value of E 2.0 tools and craft a more cohesive business entity that encourages interaction and awareness. There’s an associated white paper too.